Last year, $13280 was spent on food ingredients for all of our classes serving over 2000 people. $3100 of that was spent on ingredients from local producers (23%). 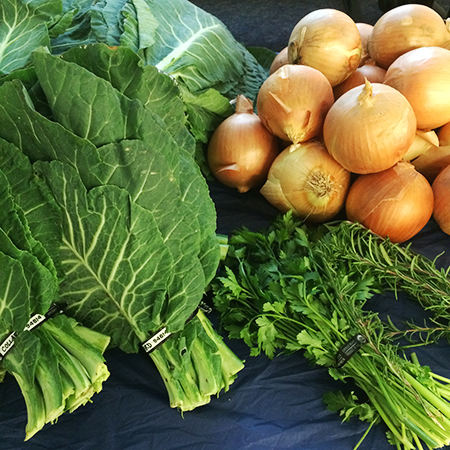 In each of the 24 free six-week community classes, at least one class recipe features local produce from vendors from the SFC Farmers’ Markets. This way, we introduce the idea of farmers’ markets and farm-fresh produce to participants who otherwise may not be aware of this resource. In other classes, such as our butchery classes, each participant not only learns how to cut up a Dewberry Hills Farms whole chicken, but goes home with it as well. Buying a whole chicken can be more work, but the price per pound decreases, therefore making it more affordable. Offering classes that highlight how to handle whole chickens or use beets complete with greens creates knowledge among cooks, shoppers and eaters, which then drives demand for these products from our local producers. By 2018, we strive to increase our local ingredient purchase to 25% of our total ingredient purchases. Thank you, Central Texas Farmers, for all of the nutritious and delicious food that you produce!